I have a fascination for ecosystem view. I wrote first about an ecosystem two years back in an article titled “technical leadership ecosystem”. In this article we explore a similar question in the context of innovation. 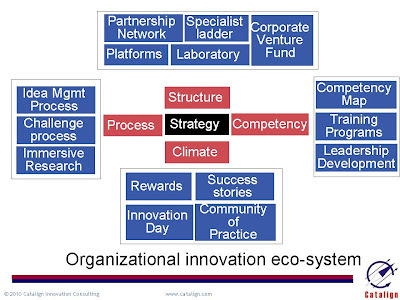 The question is: What are the elements of an organizational innovation ecosystem? The view presented above is a work-in-progress. It is currently being used to study how various elements contribute to organizations becoming more (or less) innovative. To understand how innovative you are, you can check a simple innovation dashboard. Each of the 5 elements of the ecosystem - strategy, process, structure, climate and competency - is briefly presented below. Strategy: At the heart of this view is “strategy” which answers following three questions: Where do we want to go from here? What are the choices do we have? What broad approach will we take? Strategy is not written in stone. In fact, it is more like surfing a wave and constantly evolving. Whether you begin your innovation journey by identifying a strategy is debatable. However, without a clear strategy, it is difficult to go very far in your innovation program. Process: Every innovation program needs a process for generating, selecting, prototyping, funding, implementing and commercializing ideas. In most organizations this process is supported by various sub-processes. For example, P&G has a process where every business identifies top 5 business challenges which help in generating business relevant ideas. P&G also has another process called immersive research by which employees spend several days at consumers’ house or in a retail shop. This enables insights which are not easy to find through market research. P&G also has a rigorous innovation review process. A process is not effective unless it is supported by appropriate structures, climate and competencies. Structure: Laboratories are places that enable rapid experimentation. Tata Motors has labs like Engineering Research Centre (ERC), Chassis Dynamometer Emission Lab, Instrumentation Lab, CAD centre for designing and styling etc. It has multiple platforms including the small car platform. Nano is the first product derived from the small car platform for Indian market. Corporate venture fund is a structure that funds innovation projects. A specialist ladder (also called technical ladder) provides a career path for specialists to grow. P&G has also created various structures that enable innovation. Climate: Innovation fosters in spaces that are open and conducive for collaboration especially among diverse functions. Informal or self-organizing groups like SIG (Special Interest Groups) or Quality Circles or other Communities of practice (CoP) enable innovation. Mindtree, an IT services company in Bangalore, has 53 CoPs – not all equally active. Each CoP organizes knowledge sharing sessions, competitions and news letters. Mindtree also organizes an innovation day called Osmosis where innovators present their ideas and prototypes. Competency: Innovation needs ambidextrous leaders, those who can focus on efficiency as well as new ideas. P&G puts individuals through a series of experiences where they learn to operate and innovate. Lafley identified specific competencies like design that play a crucial role in innovation. P&G created a design function and kept it outside the business units so that it could be leveraged across the company. They recruited top designers from outside. P&G also offers training courses in design thinking and improving innovation success rates. Clay Street is another place where employees spend 6 to 12 weeks and experience ideation and prototyping. Innovation ecosystem view forces us to think on multiple dimensions while running our innovation program. 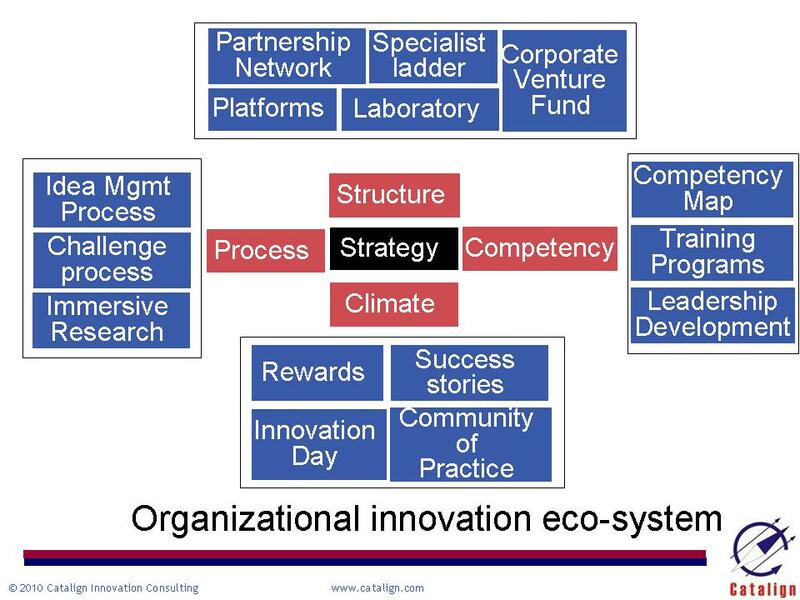 Note: I would like to thank my friend Prof. Rishikesha Krishnan for pointing out the missing element of "strategy" in an earlier version of the ecosystem view.